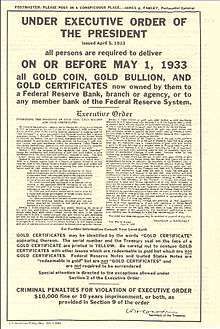 Executive Order 6102 is a United States presidential executive order signed on April 5, 1933, by President Franklin D. Roosevelt "forbidding the Hoarding of gold coin, gold bullion, and gold certificates within the continental United States". The effect of the order, in conjunction with the statute under which it was issued, was to criminalize the possession of monetary gold by any individual, partnership, association or corporation. The main rationale behind the order was actually to remove the constraint on the Federal Reserve which prevented it from increasing the money supply during the depression; the Federal Reserve Act (1913) required 40% gold backing of Federal Reserve Notes issued. By the late 1920s, the Federal Reserve had almost hit the limit of allowable credit (in the form of Federal Reserve demand notes) that could be backed by the gold in its possession (see Great Depression). If gold could not be legally owned, then it could not be legally redeemed. If it could not be legally redeemed, then it could not constrain the central bank. Executive Order 6102 required all persons to deliver on or before May 1, 1933, all but a small amount of gold coin, gold bullion, and gold certificates owned by them to the Federal Reserve, in exchange for $20.67 (consumer price index, adjusted value of $378 today) per troy ounce. Under the Trading With the Enemy Act of 1917, as amended by the recently passed Emergency Banking Act of March 9, 1933, violation of the order was punishable by fine up to $10,000 (equivalent to $183111 today) or up to ten years in prison, or both. Order 6102 specifically exempted "customary use in industry, profession or art"—a provision that covered artists, jewellers, dentists, and sign makers among others. The order further permitted any person to own up to $100 in gold coins (a face value equivalent to 5 troy ounces (160 g) of gold valued at about $6,339 in 2016). The same paragraph also exempted "gold coins having recognized special value to collectors of rare and unusual coins." This protected recognized gold coin collections from legal seizure and likely melting. The price of gold from the Treasury for international transactions was thereafter raised to $35 an ounce ($641 today). The resulting profit that the government realized funded the Exchange Stabilization Fund established by the Gold Reserve Act in 1934. Executive Order 6102 also led to the ultra-rarity of the 1933 Double Eagle gold coin. The order caused all gold coin production to cease and all 1933 minted coins to be destroyed. About 20 illegal coins were stolen, leading to a standing United States Secret Service warrant for arrest and confiscation of the coin. A legalized surviving coin sold for over $7.5 million in 2002, making it one of the most valuable coins in the world. The circumstances of the case were that a New York attorney, Frederick Barber Campbell, had one deposit at Chase National over 5,000 troy ounces (160 kg) of gold. When Campbell attempted to withdraw the gold, Chase refused, and Campbell sued Chase. A federal prosecutor then indicted Campbell on the following day (September 27, 1933) for failing to surrender his gold. Ultimately, the prosecution of Campbell failed, but the authority of the federal government to seize gold was upheld, and Campbell's gold was confiscated. Gus Farber, a diamond and jewelry merchant from San Francisco, was prosecuted for the sale of thirteen $20 gold coins without a license. Secret Service agents discovered the sale with the help of the buyer. Farber, his father, and 12 others were also arrested in four American cities after a sting conducted by the United States Secret Service. The arrests took place simultaneously in New York and three California cities, San Francisco, San Jose, and Oakland. Morris Anolik was arrested in New York with $5,000 in U.S. and foreign gold coins. Dan Levin and Edward Friedman of San Jose were arrested with $15,000 in gold. Sam Nankin was arrested in Oakland. In San Francisco, nine men were arrested on charges of hoarding gold. In all, $24,000 in gold was seized by Secret Service Agents. In 1934, Congress passed the Gold Reserve Act of 1934 which ratified President Roosevelt's orders. A new set of Treasury regulations was issued providing civil penalties of confiscation of all gold and imposition of fines equal to double the value of the gold seized. Louis Ruffino was one individual who was indicted on three counts purporting to charge violations of the Trading With The Enemy Act. Eventually, Ruffino appealed the conviction to the Circuit Court of Appeals 9th District in 1940; however, the judgment of the lower courts was upheld based on the President's executive orders and the Gold Reserve Act of 1934. Ruffino, a resident of Sutter Creek in California-gold country, was convicted of possessing 78 ounces of gold and was sentenced to 6 months in jail, paid a $500 fine, and had his gold seized. Foreigners also had gold confiscated, and were forced to accept paper money for their gold. The Uebersee Finanz-Korporation, a Swiss banking company, had $1,250,000 in gold coins for business use. The Uebersee Finanz-Korporation entrusted the gold to an American firm for safekeeping. The Swiss were shocked to find that their gold was confiscated. The Swiss made appeals, but those appeals were denied. The Swiss were entitled to paper money – but not their gold. The Swiss company lost 40% of their gold's value if they tried to buy the same amount of gold with the paper money they received in exchange for their confiscated gold. ↑ "Hoarding of Gold". The New York Times. April 6, 1933. p. 16. ↑ "How Money and Banking Work On a Gold Standard". Philosophical Economics. 28 July 2014. Retrieved 4 August 2014. ↑ Roosevelt, Franklin D. (1938). Public Papers and Addresses of Franklin D. Roosevelt, Volume II, The Year of Crisis, 1933. New York: Random House. p. 352. OCLC 690922370. ↑ Suzan, Clarke (2013-01-29). "Rare silver dollar coin sets world record auction price". abcnews.go.com. ABC News. Retrieved 4 March 2014. ↑ "Sequels". Time. November 27, 1933. ↑ "Gold Indictment No. 1". Time. October 9, 1933. ↑ "Bootleg Gold Ring Smashed in California: 13 Men Are Accused Of Violating Federal Restrictions". The Evening Independent. April 13, 1939. ↑ "FindACase: United States v. Scrap". Ny.findacase.com. 1938-01-10. Retrieved 2013-12-30. ↑ "Ruffino V. United States". Leagle.com. Retrieved 2013-12-30. ↑ "Uebersee Finanz-Korporation, Etc. V. Rosen". Leagle.com. Retrieved 2013-12-30. ↑ "FindLaw | Cases and Codes". Caselaw.lp.findlaw.com. Retrieved 2013-12-30. ↑ "Perry v. United States - 294 U.S. 330 (1935) :: Justia US Supreme Court Center". Supreme.justia.com. Retrieved 2013-12-30. ↑ United State Congress (August 14, 1974). "An Act to provide for increased participation by the United States in the International Development Association and to permit United States citizens to purchase, hold, sell, or otherwise deal with gold in the United States or abroad". Pub.L. 93–373. ↑ "Statements of Policy: Gold". FDIC Law, Regulations, Related Acts. Federal Deposit Insurance Corporation. ↑ Norman v. Baltimore & Ohio Railroad Co. , 294 U.S. 240 (1935). ↑ 216 Jamaica Avenue, LLC v. S & R Playhouse Realty Co. , 540 F.3d 433 (United States Court of Appeals, Sixth Circuit 2008). ↑ Roosevelt, Franklin D. (April 5, 1933). "Executive Order 6102: Requiring Gold Coin, Gold Bullion and Gold Certificates to Be Delivered to the Government". ↑ "Josefowitz Gold". Time. March 2, 1936. ↑ Apcar, Leonard M. (October 15, 1981). "Treasury's Vaults Disgorge Treasures from the Depression: Memorabilia, Valuables Taken When Banks Were Closed May Be Opened For Claims". Wall Street Journal. ↑ Parliament of Australia (1959). "Banking Act 1959". Commonwealth Consolidated Acts. Commonwealth of Australia. ↑ Suchecki, Bron (August 4, 2008). "A History of Gold Controls in Australia". Gold Chat. Self-published.